The Molded Plastic Eiffel Side Chair with Wood Legs faithfully recreates one of the most iconic designs of mid-20th century. Inspired by a modern classic that has continued to successfully gain popularity since its birth in the 1950's (commonly referred to as the "Molded Plastic Dowel-Leg Side Chair", "DSW" & "Shell Chair"), our accurate reproduction is stocked in an array of handpicked colors to suit any space. Sturdy and lightweight, the Molded Plastic Eiffel Side Chair with Wood Legs is a perfect choice for your dining room, establishment or home office (as a stylish & fun desk chair). 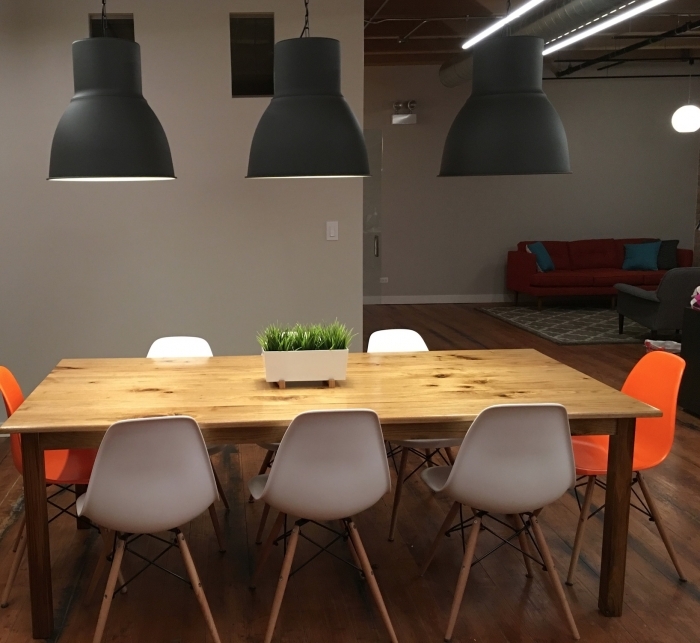 We purchased eight of these chairs for a community table in our office. They look and feel just like the original Eames design by Herman Miller, but at a fraction of the price. ProsGreat, modern design, durable construction. ConsThe screws will loosen over time and require re-tightening every few months. We were looking for modern dining chairs for our new home and found these chairs. great price with modern look! Shipping was fast, earlier then i thought. great experience with Inmod, highly recommended. I SERIOUSLY can not believe what a deal these are!!! Quality is FANTASTIC and they are JUST what i wanted!! They are amazing!! Love them and thank you! Easily tied to the room together, the perfect finishing touch to my dining room decor, thanks a bunch inmod! You can't go wrong with that vibrant blue, they matched perfectly with the blue in my office - I received them right away, I'm happy I ordered from here! Thanks! The best way to makeover your dining room - START WITH THE CHAIRS!! I didn't want to deal with new paint or light fixtures right off the bat so I started with the chairs to see, they ended up doing the trick without even having to order a new dining table either - I am really, really happy and they were so affordable as well - thanks a bunch! Really wanted this style with the wood legs but was a little disappointed that they had to be ordered in quantities of 2 as I wanted to order one of each color in the natural as opposed to 2 of each in the same color - it ended up working out OKAY but would have preferred for them to be sold individually not in pairs. As far as quality and appearance, i don't have any complaints. Such an amazing chair, definitely an amazing find, price was way better than i ever thought i would find especially for the quality, love these chairs so much! ordered in pink and i am so happy with my decision! Your customer service team pointed me in the right direction when I said I wanted pink dining chairs! These are the perfect color, the perfect size and the perfect style for my dining room! 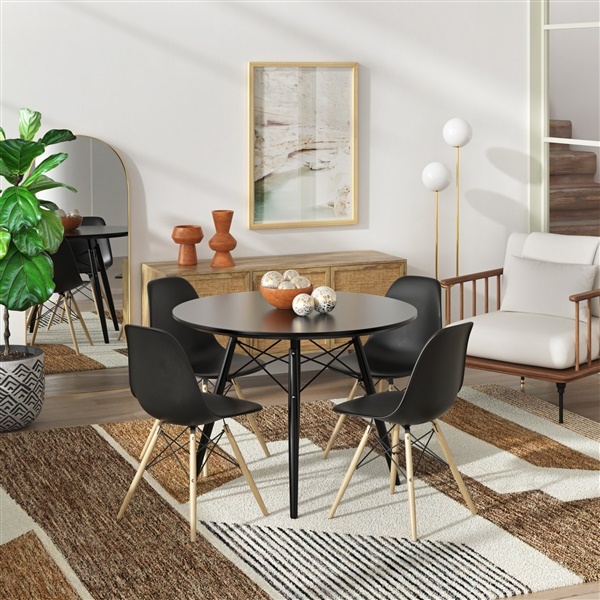 As a mid-century modern design enthusiast, i found these of excellent quality and made extremely well, the entire buying experience was smooth with no complications, i will definitely be buying here again. Exactly the modern classic i was looking for to the fill the void of mismatched chairs in the kitchen. My wife and I were looking high and low for new chairs but weren't keen on the chrome base. She came across these and we knew we found what we wanted. We ordered these through Stacy in customer service and she is AWESOME. They made it very easy and we are over the moon with our purchase. I bought these in pink for my kitchen table and they are awesome! They are super comfortable and are a really good reproduction of the original. They were easy to assemble also. ProsGreat color! Easy to assemble and comfy! I received my black molded plastic chair this week. Finishes seem nice, everything went together well (have to attach seat to base). Looks great in our mid-century ranch kitchen. Shipping box was totally destroyed when product arrived. Really expected it to be damaged, but to my surprise was fine. No one would ever guess its not a HM. I would recommend this item, especially at the price. May I order 4 in 4 different colors instead of set of 2 in the same color? We are only able to sell each color in a quantity of 2, as this is how the manufacturer pre-packages the chairs for shipment. From what type of wood are the dowels made? The legs on our chair is made from beech wood. Is the chair made of injection molded colour dyed through polypropylene plastic? The Molded Plastic Side Chair seat is made with injection molded color dyed through Acrylonitrile Butadiene Styrene (ABS) plastic. Can you order only 1? Unfortunately, we are unable to accept an order of only 1 unit, as the manufacturer boxes this item in quantities of 2 for shipment. Hello, how much does each chair weigh? and what is the maximum weight that this chair can accomodate? The weight of each chair is approximately 12.5 lbs. Our Molded Plastic Side Chair with Wood Legs is rated for use up to 250 lbs. What is the height, in inches, from the floor to the front seat lip? The height to the front seat lip is approximately 16". is it suitable for someone of 240 lbs? Our Molded Plastic Side Chair with Wood Legs is rated for use up to 250 lbs. Just wondering if the white is easy to clean or will it get dirty fast? This chair is very easy to keep clean and it does not get dirty easily. You can clean easily with just soap and water. does the molded plastic have a matte or shiny finish? thank you. Our Molded Plastic Side Chair with Wood Legs has a matte finish. Is the plastic seat smooth plastic does it have a texture? The seat for the Molded Plastic Side Chair with Wood Legs does have a bit of a textured feel to it.